New routes open up America’s Midwest region across multiple states. WOW air, Iceland’s low-cost airline, has announced flights from Ireland to four new US destinations via Reykjavik: Detroit (MI), St Louis (MO), Cleveland (OH) and Cincinnati (OH). Flights will commence in 2018, with fares from Dublin Airport starting at €129.99, including taxes and charges. Flights to Detroit will commence on 25 April 2018; to Cleveland on 3 May 2018; to Cincinnati on 9 May 2018; and St Louis on 17 May 2018. All routes will operate flights up to four times a week. Passengers can also avail of the WOW stopover option and explore Iceland on either leg of their transatlantic journey for an unlimited time. The new destinations offer something for every visitor. Detroit, or Motown to music lovers, is the home of American soul and R&B music. St Louis, the Gateway to the West, is a haven for foodies, especially barbecue connoisseurs. Cleveland is one of the US’s sporting capitals and the stomping ground of teams like the Cavaliers, the Browns and the Indians. Tourists in Cincinnati can explore America’s complicated past at the National Underground Railroad Freedom Center. Commenting on the announcement, Skúli Mogensen, CEO and founder of WOW air, said: “At WOW air, we are committed to our mission of offering our Irish passengers more affordable travel options to North America at the lowest fares. 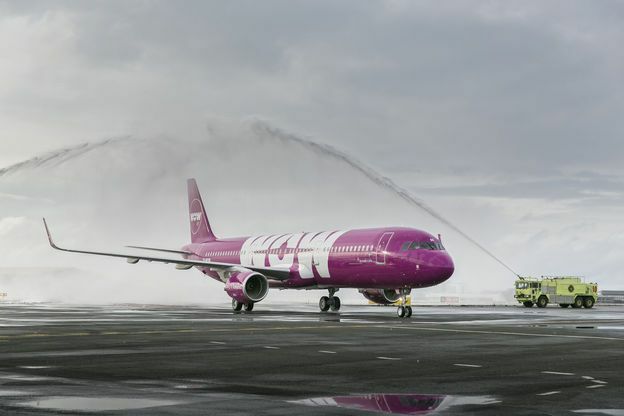 WOW air became the first airline to operate direct scheduled flights between Ireland and Iceland in June 2015. The airline flies Dublin to Reykjavik five times weekly, increasing to daily in peak summer times. The four new destinations will bring the total number of WOW air North American flight routes to fourteen. From Ireland, the airline currently flies, via Reykjavik, to New York , Boston, Washington DC, Toronto , Montréal, Miami, Los Angeles, San Francisco, Chicago and Pittsburgh. WOW air is Iceland’s only low-fare airline and the most punctual, with 92% of flights arriving on time in 2014. WOW air offers the lowest fares, a modern fleet with the lowest emissions and the biggest smile; this is the WOW air promise to its valuable customers. The airline began flying to Reykjavik Iceland from Dublin in June 2015. WOW air flies Dublin to Reykjavik five times weekly, increasing to daily in peak summer times. WOW air has since launched a number for US routes from Ireland via Reykjavik. Flights connect passengers to ten North America destinations via Reykjavik including New York, Boston, Washington DC, Toronto, Montreal, Miami, LA, San Francisco and Pittsburgh and Chicago. Established in November 2011 by Icelandic entrepreneur Skúli Mogensen, the purple airline currently flies three Airbus A320 aircraft across Europe, three Airbus A330 aircraft and eleven Airbus A321 aircraft that service its transatlantic routes. By the end of 2018 the fleet will consist of 24 brand new aircrafts.